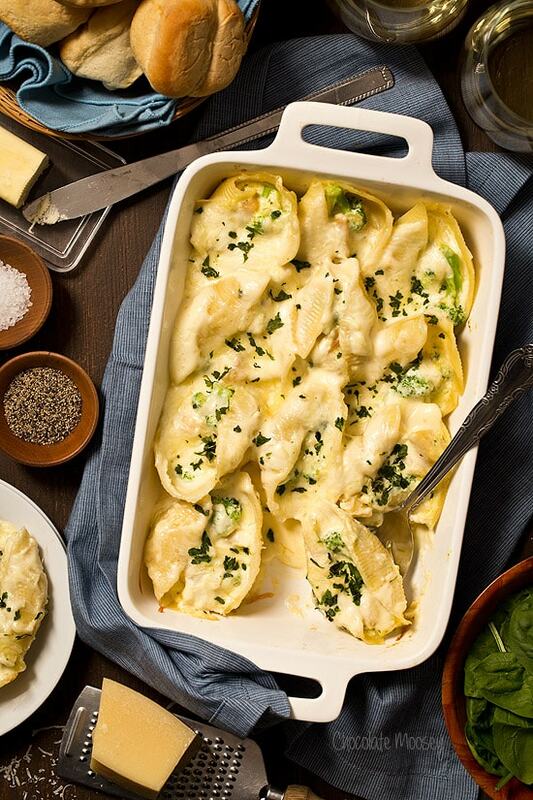 Take some time from your busy schedule for a good home-cooked meal with Chicken Broccoli Alfredo Stuffed Shells For Two with homemade Alfredo sauce. I’m all about quick dinners, but once in awhile, I want a good home cooked meal. One where you can sit down with a fresh basket of rolls, a side dish (because I never have time for sides during the week), and a glass (or two) of wine. 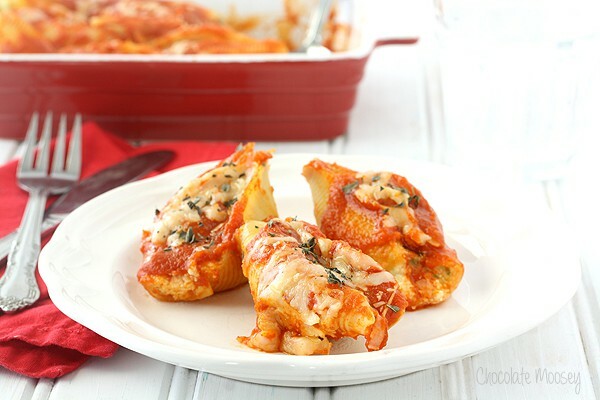 Stuffed shells and lasagna are two dishes I rarely make because they take time and typically make large servings, too large for someone who cooks for one or two people. Luckily I figured out how to scale them down with my buffalo chicken lasagna for two and three cheese stuffed shells for two. 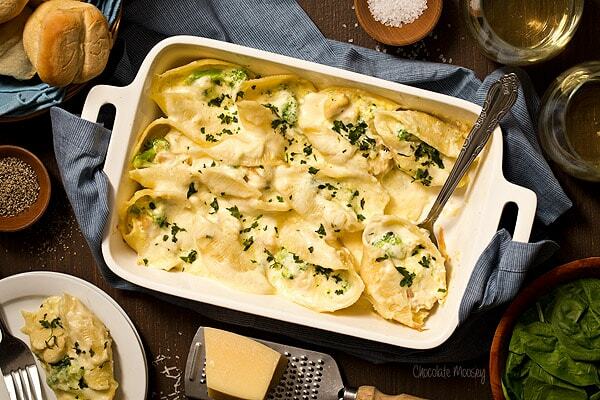 Ever since I made the cheese stuffed shells last year, I had the idea for these Chicken Broccoli Alfredo Stuffed Shells. I love anything with a good Alfredo sauce, especially when broccoli and either chicken or shrimp are involved. This time around I chose chicken as it’s a more affordable protein, but you can easily substitute shrimp if you’re in the mood for seafood Alfredo. Or make it vegetarian by substituting lots of mushrooms. Or add mushrooms with the chicken or shrimp. Or go all out with both chicken and shrimp. 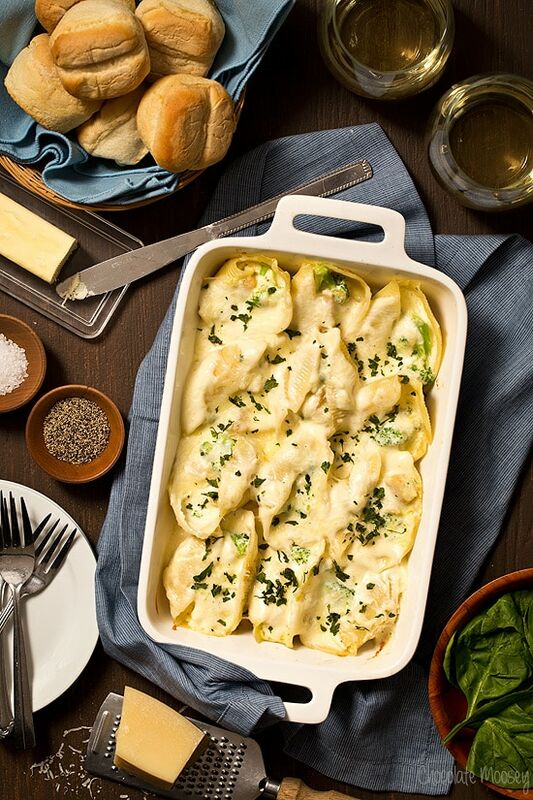 The beauty about cooking at home is you get to make stuffed shells your way. 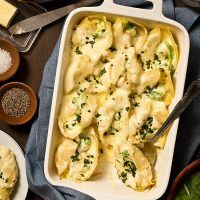 There are multiple steps to making stuffed shells since I also make a homemade sauce, but there are several ways you can save some time. First is the chicken. I hate when recipes call for already cooked chicken because there’s a 99 percent chance I don’t have any and have to take the extra time to cook some. I’m guessing you don’t either, so I included cooking chicken in the instructions. If you have leftover cooked chicken or a rotisserie chicken on hand, that’ll save you some time. Sometimes if I know I need chicken for two different recipes within a few days of each other, I’ll cook up some extra. Second is the sauce. You can easily make the Alfredo sauce ahead of time and refrigerate until ready. If it’s too thick after warming it up, you can stir in a little extra cream to thin it out. Third is the broccoli. I used fresh because I had some to use up, but you can easily use frozen, which is already chopped for you. Confession: I find making recipes for two a little tricky sometimes. On one hand, this recipe makes 4 servings. On the other hand, most people often eat 2 servings each, so this would feed 2 people at dinner time. Or it might feed 2 people with a few shells leftover for lunch the next day if you serve it with bread and a side. I personally enjoy having some leftovers as I don’t have to make lunch the next day (or in the case of these shells, the next 2 days since I’m the only one eating them). Preheat oven to 350F. Have a small casserole dish ready. Bring a large pot of salted water to a boil. Cook the shells according to package directions, about 14-15 minutes. During the last 2 minutes of cooking, add the broccoli. Drain and let cool. While the pasta is cooking, in a large skillet over medium heat, heat the oil. Add the chicken and onion and cook for 3 minutes. Flip and cook for another 3-4 minutes or until the chicken is fully cooked. Add the garlic and cook 30 seconds. Remove from the heat. While the chicken is cooking, make the sauce: In a large saucepan, melt the butter. Slowly whisk in the cream then whisk in the cheese. Bring to a boil. Cook for 3-5 minutes or until thickened. 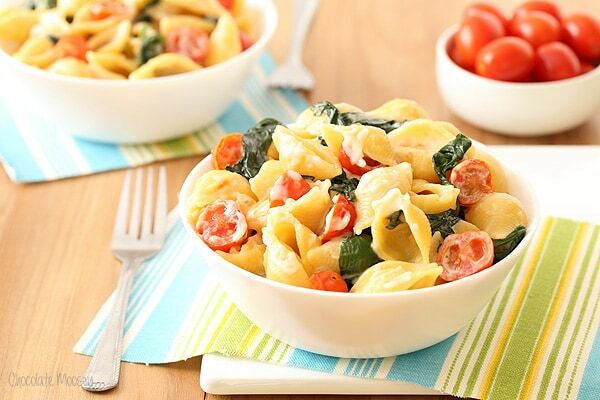 In a large bowl, mix together the ricotta, 1 cup mozzarella, Parmesan, salt, basil, and egg. Add the chicken and cooked broccoli. Spread 1/4 cup Alfredo sauce on the bottom of the casserole dish. Stuff each shell with some of the ricotta mixture and place snug inside the dish. Top with remaining sauce and mozzarella cheese. Cover with foil and bake for 20 minutes. Remove the foil and bake for another 5 minutes or until the cheese is melted on top. It’s the first time I see these pasta beauties! My list with fillings is becoming increasingly enormous! This looks so good! I love cozy dinners like this – love that it’s for two! The perfect comfort food for date night ;) Thanks April! Hi! Do you think the shells could be made/stuffed ahead of time and popped in the oven later? Thank you! Yes, you can do that. I would put the sauce in the bottom of the pan as directed, add the stuffed shells, then cover and refrigerate. Right before baking, pour the remaining Alfredo sauce on top. That way, the sauce doesn’t dry out/get absorbed into the pasta while it’s sitting. If the sauce thickens too much after refrigerating, reheat it either in a saucepan or the microwave (possibly with a little more cream to smooth it out). 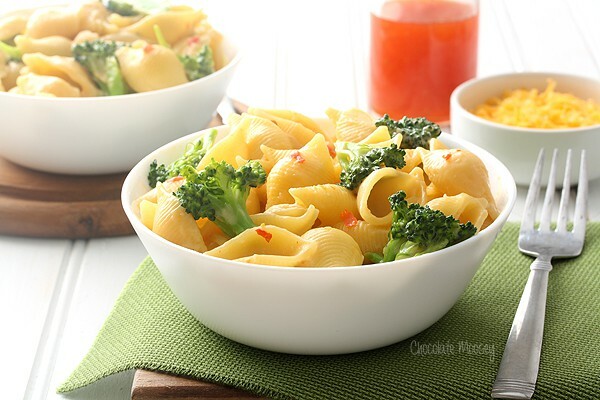 Could you use jarred alfredo sauce to save time? Holy f*** this was amazing. To die for ! The best. Unfortunately, we found it rather bland. I even upped the garlic and added sautéed chopped mushrooms. There is definite room to improve here and add some actual flavor. Thank you for the feedback. How much salt did you use? Did you salt the chicken? Did you use the full amount of Parmesan cheese in the sauce? I made this for my boyfriend and he was in love with the recipe! My mouth is watering just thinking about it. Happy to hear you both loved it!